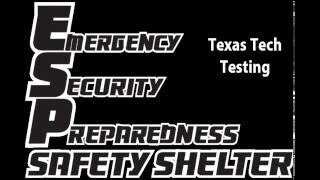 The Swisher ESP Safety Shelter has undergone and passed testing at the National Wind Institute at Texas Tech University. The ESP Shelter has been tested and withstood a total of 9 impacts from 15 lb 2x4’s traveling at 100 mph. These impacts are equivalent to the force produced by an F5 tornado with 250 mph winds. In addition it meets or exceeds all requirements put forth by NSSA, FEMA 320 and ICC-500 standards. 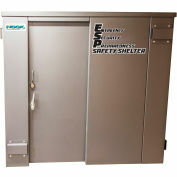 ESP (Emergency – Security – Preparedness) Safety Shelters (ABOVE GROUND ONLY) offer the ultimate in multi-purpose protection and security for you and loved ones against violent acts of nature and multiple threats posed by man. 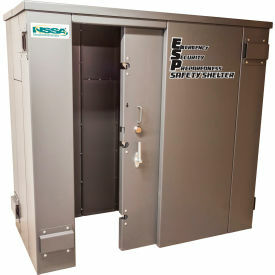 Each ESP Safety Shelter is verified to be in compliance with the National Storm Shelter Association Standards (NSSA). 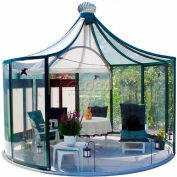 Each ESP Safety Shelter will meet or exceed all ***FEMA P320/P361 and ICC-500 Code requirements*** when all installation guidelines are met (step-by-step installation checklist is provided with each ESP Safety Shelter). All Shelters have been designed by Registered Structural Engineers and have undergone a rigorous Third Party Review process. Made in the USA ESP Safety Shelters will withstand the most extreme tornado activity and offer a "safe zone" against home invasion offering critical minutes for emergency assistance to arrive. Statement from FEMA P-320: "Having a safe room built for your home or small business can help provide "near-absolute protection" for you and your family or employees from injury or death caused by the dangerous forces of extreme winds." Near Absolute Protection definition from FEMA P-361: Level of protection afforded to the occupants of a safe room built according to the guidance in the most current edition of FEMA P-361. Our current knowledge of tornadoes and hurricanes indicates that safe room occupants will have a very high probability of being protected from injury or death. The entire shelter is made from 3/16" (0.188") thick carbon steel, all hardware is Grade 5, and the majority of all surfaces are powder coated for ultimate protection and appearance. The door design and materials used each critical aspects of any safety/storm shelter. The Swisher® ESP Safety Shelter™ has a sliding reinforced steel door that is unique to the market and eliminates all the problems commonly associated with inward or outward swinging doors. APPROVAL/REGULATIONS"Certified by NSSA to meet or exceed FEMA 320, FEMA 361 & ICC-500 "